In ironwork the manifestation of a true constructive principle is beyond all things desirable. Iron, being a strong material, should not be formed into heavy masses unless immense weight has to be sustained or very great strength is required. If we form lamps, candelabra, and such works of iron, it is obvious that the portions of metal employed in their construction may be thin, as the material is of great strength. Were we to form such works of wood, then a greatly increased thickness of material would be necessary, in order that the same strength be secured, as wood is not nearly so strong as iron. My remarks will have special reference to wrought iron, as cast iron cannot so fully be said to have a constructive character. 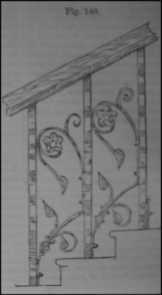 A small railing (fig. 133), which we engraved in our last article (page 217), is an admirable illustration of a true constructive formation, as the parts are all held together, and strengthened to a woderful degree, by the introduction of a horseshoe-shaped member. This railing is worthy of the most careful study, for its strength is great. Besides strength, we have also beauty. The horseshoe form, especially when judiciously applied, is far from being offensive. Utility must come first, and then beauty, and so it does in this particular railing, but here we have great simplicity, and a correct structural character has been arrived at in its production rather than any elaboration of the principles of beauty. From the catalogue of J.W. 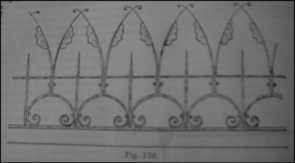 Dovey, of John Dalton Street, Manchester, I select an illustration of structure in the form of a candelabrum which is highly satisfactory in character as a simple work (Fig. 138). There is a solidly formed heavy base, an upright stem terminating in a candle-holder. There is an arrangement for catching waste grease, and extra strength is given to the stem by four slender buttress-like brackets, which are securely and well attached to the base below and to the stem above; and these are strengthened by two hoops, which prevent their bending under pressure. Figs. 139 and 140, the former being a ridge or wall cresting, and the latter a stair railing, are each illustrations of a correct treatment, inasmuch as strength (a structural quality) and beauty (an art quality) are secured at the same time. Fig. 139, it may be noticed, is admirably constructed, only it is a little slender above the middle horizontal line. These two illustrations are also from Mr. Dovey’s excellent catalogue. In the catalogue just named, and in others to which access may be had, many good examples may be found illustrative of the successful combination of true structural qualities with a considerable amount of beauty, and also acknowledging the strength of the material by the lightness of the parts. Those who reside in or visit London, will do well to go to the South Kensington Museum, and study a large and splendid candelabrum of Messrs. Hart, Son and Peard, which is well worthy of consideration. It is rather heavy, and is of enormous strength, but in most other respects it is highly commendable. It is beautiful, well proportioned, and illustrative of a correct treatment of metal. Besides this, it exemplifies the manner in which stones or jewels may be applied to works in hardware with advantage. 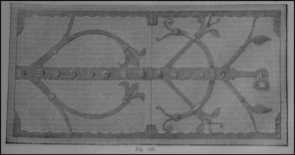 As a further illustration of a correct and very beautiful treatment of metal we give one segment of the Hereford Cathedral Screen (Fig. 141), the work of that most intelligent of metal-workers, Mr. Skidmore of Coventry. 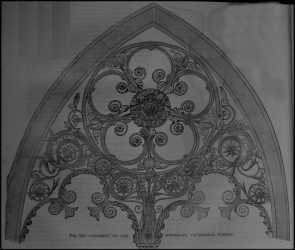 This screen was shown in the International Exhibition of 1862, in London, and was from there removed to its place in the cathedral. All who can will do well to view this beautiful work, which is one of the finest examples of artistic metal-work with which we are acquainted. Notice the ease with which iron may be treated if a correct mode of working be employed. Let a bar of iron be taken which iks about half an inch thick by 1¼ broad. This can be rolled into a volute (the filigree mode of treatment), or its end can be hammered out into stems and leaves, and to it can be attached other leaves by rivets, screws, or ties, or it can be bent into any structural form. To the student I say, study, by the observation of well-formed works, the shapes into which simple bars of iron can be beaten. Brass, copper, and other metals may be associated with iron in the formation of any works. If well managed, brass and other bright metals may act as gems – that is, they may give bright spots; but where the bright metals are used with this view, care must be exercised in order that the bright spots be formed by beautiful parts, and that their distribution be just, for that which is bright will attract first attention. Before leaving this part of our subject, I must call attention to a hinge by Hardman, of Birmingham, which was shown in the International Exhibition of 1862, as it is both quaint and beautiful (Fig. 142). The door to which this hinge was applied opened twice; the first half opened and folded back on the second half, and then the two halves opened as one door, as will be seen from our illustration. It is very desirable that we have a little novelty of arrangement in our works. We are too apt to repeat ourselves, hence it is a sort of relief to meet with a new idea. It is impossible that I take up each article of hardware and consider it separately. All I can do is to point out principles, and leave the learner to consider and apply them for himself – a principle which, once understood, may result in the construction of many excellent works, and may lead to the formation of a correct judgment respecting such objects as may be brought forward for criticism. I will, however, just call attention to gas-branches, as they are often wrongly constructed. A gas-branch is a duct through which gas is to be conveyed. It must be strong if it is to be exposed to pressure, or if it runs the chance of coming in collision with the person, as do standard lights in public buildings. The main part of a gas-branch is the tube or pipe which is to convey the gas, but this may be supported in many ways, as by such buttress-like brackets as in the candelabrum shown in Fig. 138; and if there are branch tubes for several lights, these may well be connected with the central tube, not only by their own attachment, but by brackets of some sort, or with one another by some connecting parts. Whether the gas-branch be pendent or standard, this mode of strengthening the tube-work should be employed, for the tubes themselves are but slightly held together, and by pressure being brought to bear upon them, a dangerous and expensive escape of gas may result. In the manufacture of gaseliers one or two Birmingham houses have certainly distinguished themselves by the production of works both beautiful and true; and these lead me to think that a better day is dawning for Birmingham, in which its art shall be exalted rather than degraded, and shall be such as will win to it the esteem of the world rather than call forth the execrations of art-loving people. As to the colouring of iron I can say little. In my judgment the best modes of colouring metals were originated by Mr. Skidmore of Coventry, of whom I have before spoken. His theory is this, that metals are best coloured by the tints of their oxides. When a metal, especially brass, is seen in a furnace in a molten condition, the flames, where the oxygen of the atmosphere is uniting with the vapour of the metal, present the most resplendent tints. The same thing in na lesser degree occurs in the case of iron, but here the colours are less brilliant, and are more tertiary in character. Mr. Skidmore applies to a metal the colours seen in the flames of the furnace where it melts. Without attempting to limit the colourist to any theory whereby his ideas might be restricted, I must say that Skidmore’s colouring of the metals is very good.